Send wireless measurements from the SmartConnect™ Kitchen Scale to the Escali SmartConnect app on your Apple or Android mobile device for detailed nutrition analysis, to create a food journal or simply measure in cups and tablespoons. 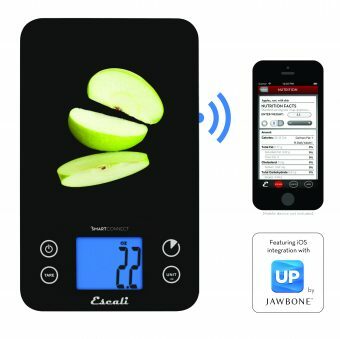 The bright back-light display, tare feature and included kitchen timer ensure this kitchen scale is useful even when it is not paired to the Escali SmartConnect mobile app. Wireless weight measurements are sent to the Escali SmartConnect mobile app with Bluetooth® Low Energy technology for enhanced features. Analyze up to 35 nutrients from a database of over 8,000 food items and save those measurements in a private food journal to graph nutrition over time and spot trends. 3 AAA batteries included. Mobile device not included.